Why we need a minimal core gazetteer or “spine” of untyped “places”, rather than typed geographical features. 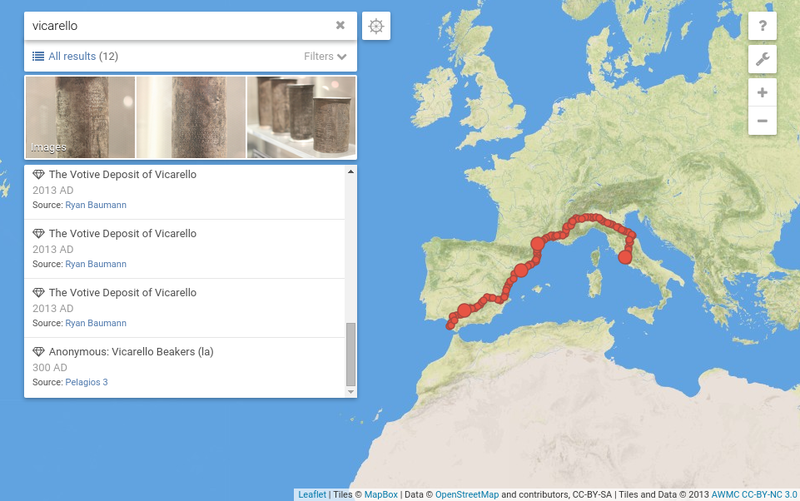 Why historical researchers should use an existing open gazetteer as our spine, rather than build one from scratch — although the answer might well be different for archaeologists and classicists, working with places which arguably no longer exist. Crowd-sourcing has made other gazetteers too big in unhelpful ways, creating ambiguity and other confusions, whereas Wikipedia’s “notability” requirement, coupled with an active editing community, keeps a lid on this. In practice, Wikidata provides a much higher ratio of names to places, although of course they lack attribution beyond the language edition of Wikipedia they come from. We have just about finished creating a system for periodically downloading and ingesting new versions of Wikidata, which includes fairly complete entity attributes and instance-of information. As Wikidata has grown it has become more important to be able to filter out entities which have locations but aren’t really “places”, and this additional information will enable that filtering. One key issue is how to do this filtering, as far as possible, in a language-neutral way. 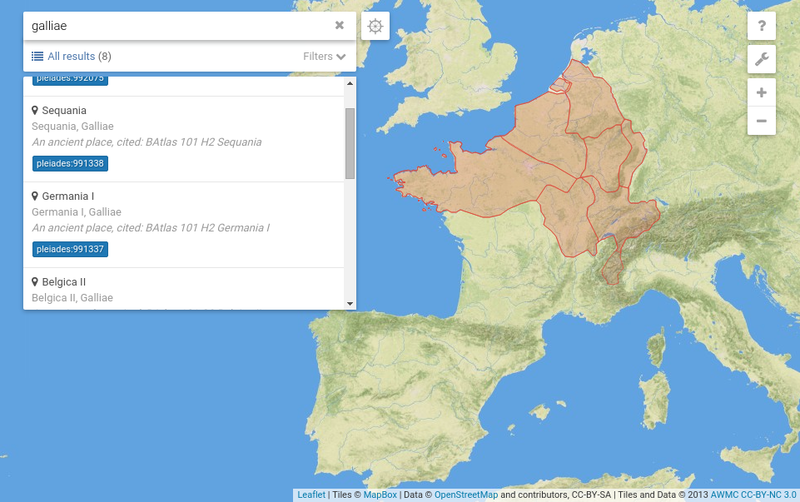 We have also done a bunch of work creating both a PastPlace API and a user interface that, unlike Wikidata’s own interface, look and work like a gazetteer APU and UI; and in particular a UI which shows places on a map. The PastPlace user interface also uses the React framework developed by Facebook to provide a responsive web design which aims to work well on mobile devices as well as on PCs. NB embarrasingly, that interface currently does not work, but fixing it is a priority now that the revised ingest system is working. We aim to keep those interfaces running, but we won’t do a big public launch of PastPlace until there is more historical content. The current version inherits considerable historical content, including attested place names, from our Vision of Britain system, but of course that is only for Britain. We are working to integrate around 100,000 entries containing around 7m. words from the Gazetteer of the World: Or, Dictionary of Geographical Knowledge, published in Edinburgh in the 1850s, but we also want to add name attestations gathered by academic partners — following Pelagios principles, we aim to link in anything that can be supplied as an annotation containing a place name, the Wikidata ID of the entity it is a name for, and some kind of URI for the historical source. My next posting should hopefully be about our first attempt at filtering, but it would be helpful to have comments from anyone who has used the existing unfiltered PastPlace gazetteer about what we should be trying to filter out. Another issue is what issues are best addressed by trying to alter Wikidata itself, and how this should work; this is certainly how issues of positional accuracy should be addressed. After a period of some behind-the-scenes changes at Pelagios HQ (with institutional moves to Lancaster University and IEC and a new programmer extraordinaire in the form of Andrew Lindley, AIT) we’re delighted to tell you our exciting news. A new phase (technically, ‘Pelagios 6’) has begun and this time it’s all about you. 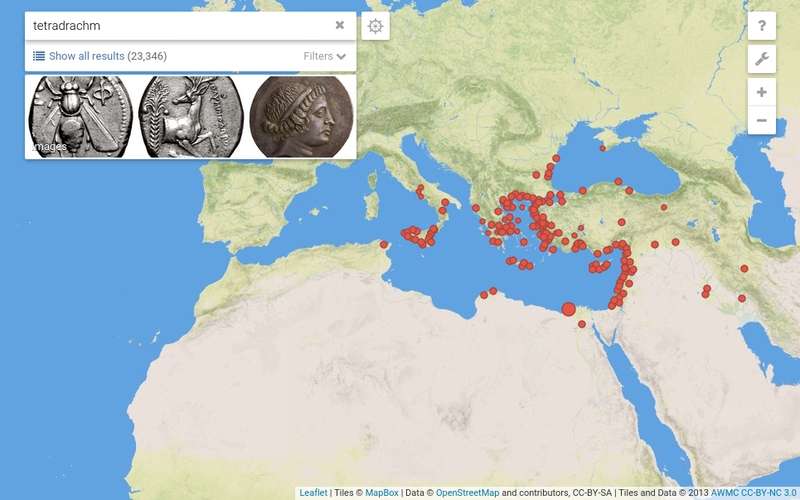 The last couple of years have seen a particular emphasis on technical developments and annotating early geographic documents so that we could apply a Linked Open Data approach beyond the classical Mediterranean. As we move forwards we will be wholly dedicated to growing and supporting our community: the Pelagios Commons. The principal mechanism for doing so is through 10 Special Interest Groups (SIGs) dedicated to inter-connecting resources across all periods and a variety of genres. The SIGs will have access to funding to hold international events and create resources, and they will also collectively direct our overall strategy as we move forwards through a new Pelagios Commons Committee. We’re not turning our back on technical development either. 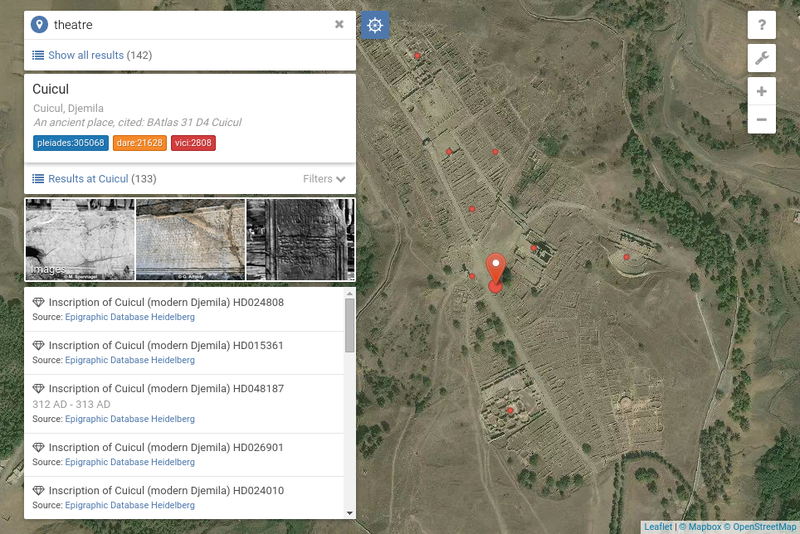 We plan to make our flagship tools and resources – Recogito, Peripleo and our map tiles – easier than ever for people to use, and we’ll be integrating them in with other exciting projects in the Digital Humanities. Regular visitors will also notice that we’re sporting a new look and a new website. That’s partly so we can bring together most of our activity under one digital roof thanks to the marvellous Commons in a Box platform. We’ve still got the builders in so please excuse any mess for now, but we hope you’ll like the changes as much as we do. We have once again been very generously supported by the Andrew W. Mellon Foundation who will fund the project through 2016 and 2017. Over that period we will also continue to develop our long term sustainability strategy to ensure that the fruits of our collective effort will be around for the long haul. So spread the word and join the fun. There’s never been a better time to get involved. As Pelagios 3 and 4 are getting close to wrap up, we hosted an event at KCL in London called Linked Pasts. We’ve been meaning to write a post about it but our friend and fellow-LOD-traveller Holly Wright has just done a terrific job describing it over at the ARIADNE blog and so it seems to make sense to point you over there. We’re hoping to arrange similar events in future so if you’re interested in how the Linked Open Data ecosystem for the humanities is evolving then let us know and perhaps even consider hosting it! We’ll post links to the presentations shortly, but in the meantime you may want to check out the reports of the people, places and periods breakout groups. A huge thanks to everyone who took part for making it such a success (and especially to Gabriel Bodard who really helped us pull it all together). There’s been quite a loooong silence on this blog about our tool development activities. Not that we’ve been idle. Far from it: we’ve been as busy as ever in our top-secret underground hideaway. Those of you following us on twitter may have noticed the occasional screenshot or info-bite leaking out. 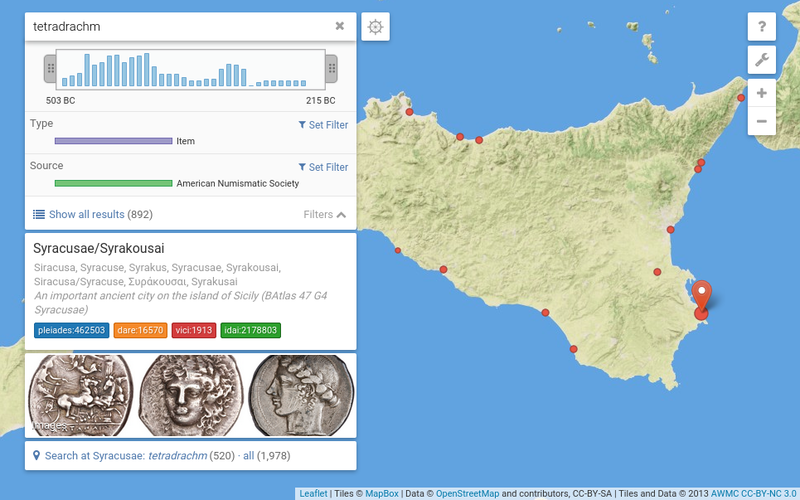 But today we’re finally ready to give you a first comprehensive sneak preview of what we’ve been up to: the development of a spatio-temporal search engine for Pelagios. Everyone, meet Peripleo. 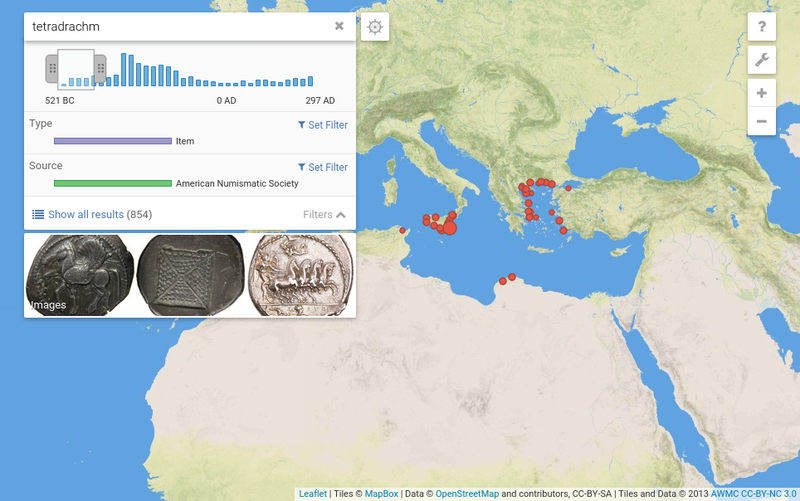 Peripleo is Greek for “to sail (or swim) around”, and the notion of being able to freely navigate the “sea of open data”, collectively brought together by our partners (and discovering the treasures hidden in remote places and ancient times!) is exactly what we had in mind when we started out. To see how Peripleo works, let’s take a swim through two examples. First, let’s search for ‘tetradrachm’, a particular coin type. This brings us to the following result, shown in Fig. 1: a total of 23,346 hits, and a map with a distribution of lots of small dots (and one slightly larger than the rest), indicating where those results are located. We also get some preview images for our results. Fig.1 Search results for ‘tetradrachm’. Let’s flip open the ‘filters’ panel to find out a bit more about those results (Fig.2). The filters panel shows us how our result data are organised. In this case, it tells us that most results come from the American Numismatic Society Collection, with a small fraction of hits (hovering the mouse over the bars tells us there are nine) coming from the Fralin | UVa Art Museum Numismatic Collection. 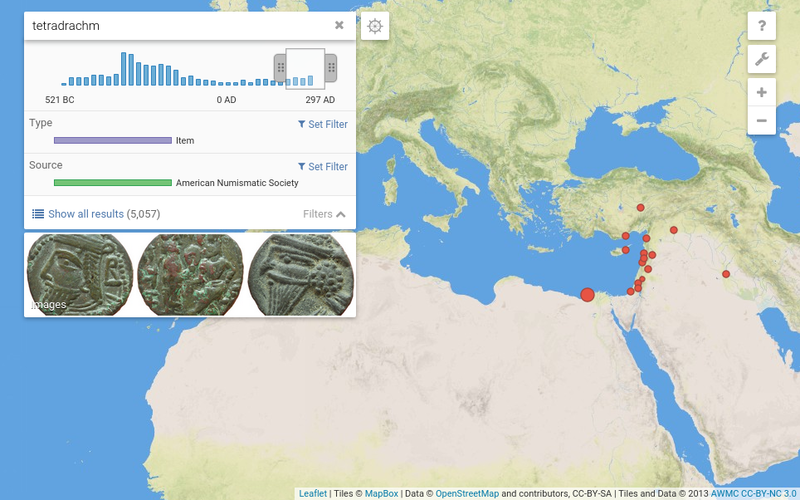 We can also see how our results are distributed over time, between the 6th century BC and 3rd century AD, with the peak at around 300 BC. The biggest dot in the region indicates the place with the most results. Clicking it reveals that it’s Syracusae, and that 520 of our 892 results in the area are linked to it. We can move the map around to explore how the temporal distribution differs in other areas; and all the time Peripleo will live-update the contents of the filter panel, as well as the image previews. Let’s take a break and zoom back out, so that we can view all our results again. You may notice handles around that blue time distribution graphic. These handles are draggable. Let’s pull them to select a time range in the beginning of the graphic: somewhere between 500 and 400 BC, say. Peripleo now shows results only from that time span. If we drag the selected range across the graphic, we’ll see how the geographical spread of our results changes over time. Fig. 4 shows the map at the start (Fig.4, left) and end (Fig.4, right) positions of this shift, with distinctively different ‘footprints’ at the beginning and end of the overall time period. Let’s try another example and search for the term ‘theatre’. This time, Peripleo comes up with a handy set of 483 results (plus some corresponding preview images). 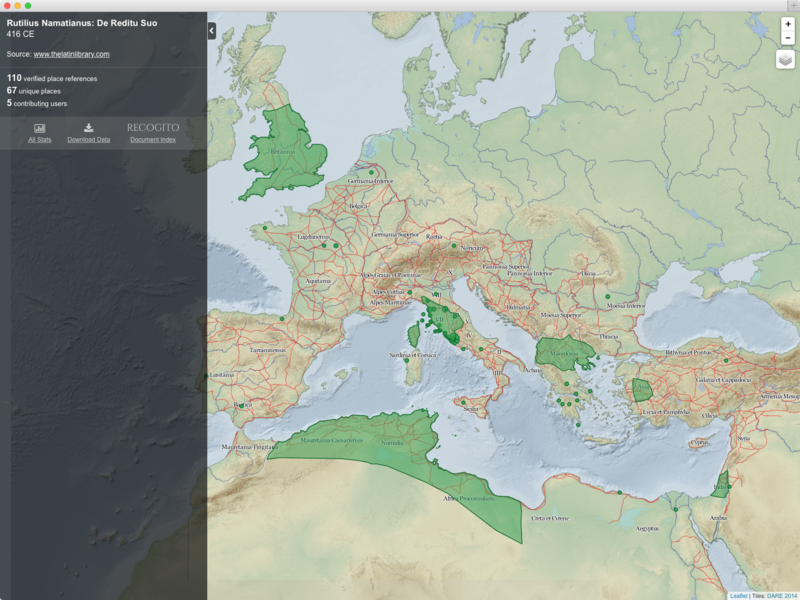 The filters panel tells us that results come primarily from Vici.org and the Flickr photostream of the Aerial Photographic Archive for Archaeology in the Middle East. Before exploring any further, though, let’s first switch the backdrop to an aerial imagery baselayer (Fig. 5). Now let’s move the map to a region we’re interested in, say North Africa. Again, thumbnail images will update as we go along; and hovering over a thumbnail will place a marker at the location the thumbnail is from. Let’s take a closer look at one of the results by clicking on its thumbnail (Fig. 6). 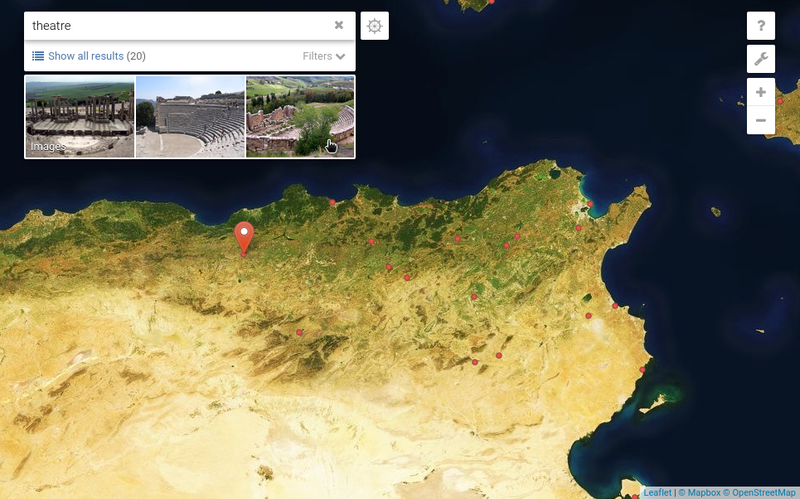 The map will zoom in on the place we selected: a Roman theatre at Djemila, Algeria, that’s recorded in Vici.org. Peripleo indicates that no additional data is linked directly to the theatre. But let’s see whether we can find something interesting in the area around it. 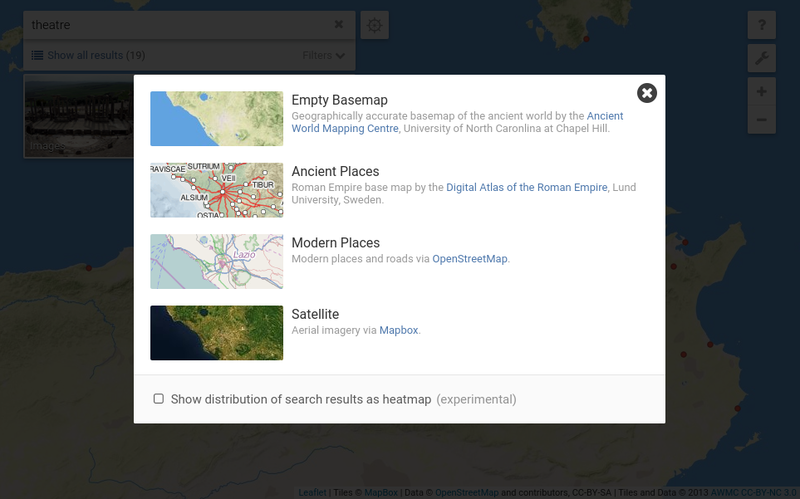 We can do this by clicking the blue ‘explore this area’ button, next to the search box. Peripleo brings up markers for other places nearby, sized according to how much data there is available for them. In this case, we can, for example, quickly spot the marker for Cuicul, the main settlement, which is linked to 133 inscriptions recorded in the Epigraphic Database Heidelberg. This illustrates some of the things that you’ll be able to do with Peripleo. But there are more things coming! For example: the scenarios above might give the impression that Peripleo is limited to treating places as points; and each item needs to be located at one specific place. That’s not the case. Places in Peripleo can cover regions – see e.g. a search for ‘galliae’ in Fig. 8 (left) below. (Peripleo makes use of the Creative Commons ‘Polygon Shapes for Pleiades Regions’ dataset by Pedar Foss, AWMC.) Items can be connected to anything from a single place, to thousands – see e.g. a search for ‘vicarello’ in Fig. 8 (right), which returns, among other things, the Vicarello Beakers and the entire Itinerarium Gaditanum inscribed on them (along with the beautiful CC-BY photographs by Ryan Baumann). 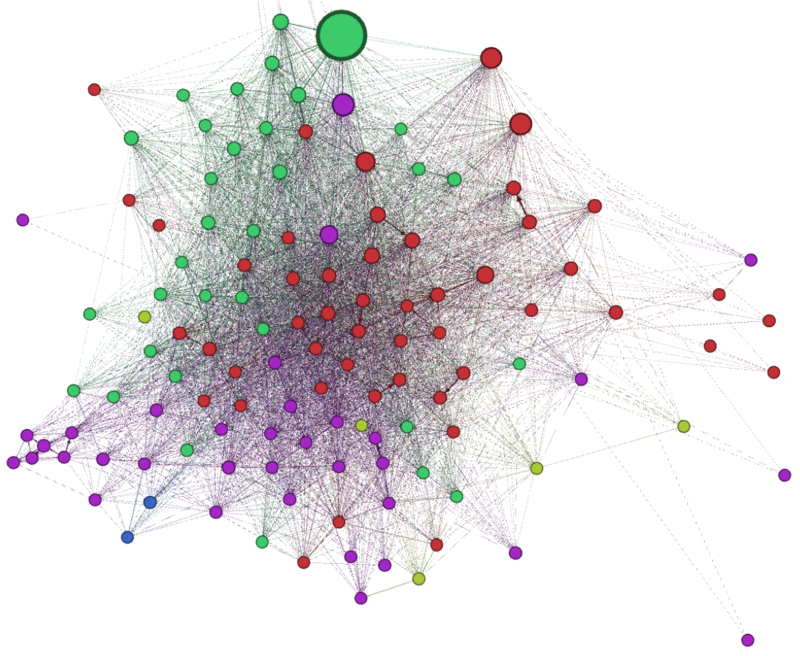 We feel that Peripleo offers a tantalising glimpse into a new way of doing research, of discovering what’s in the data, and revealing connections that would otherwise have been much harder to trace. Yet this work marks only the first steps towards tapping into the vast potential of the digital resources brought together by our partners, collectively and openly. That is to say, Peripleo is still a work in progress. Or, as I like to say, playing with Peripleo isn’t “beta testing” just yet, but rather like taking a stroll across a busy construction site. Nonetheless: we’re really eager to get first test users into the system, and find out what YOU think. What works? What doesn’t? So, if you’re not afraid to put on your hard hat, and don’t mind stumbling across the occasional unfinished area – we’d love to invite you to have a play with Peripleo yourself. Do drop us a line if you’re interested to take a look & we’ll give you access right away. We’d love to hear your feedback! This post has been written by first-year students of the master “Humanités classiques et humanités numériques“. Due to our background, we were immediately interested in the way literary texts are dealt with in Pelagios. 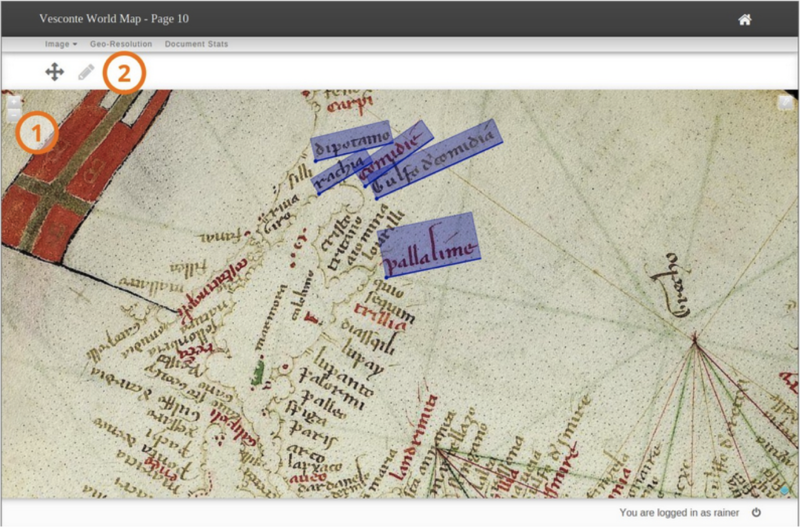 The idea was to choose a text and mark up all place names we would find with the Recogito tool. Our aim was to have a direct experience of the issues raised by digital editing, one of the core activities of digital humanists. Through the actual marking up of Rutilius Namatianus’ De reditu suo (a text describing his return from Rome to Gaul – see the map) and the collaborative revision process, we realised that it was not that easy, in some cases, to determine whether a word was indeed a place name and, if so, whether it had to be marked up and indicated on the map. For instance, one special feature of ancient texts is that they frequently refer to mythological places. But is a mythological place really a place in this context? Should we mark up Mount Olympus when it appears as the home of the Greek gods? 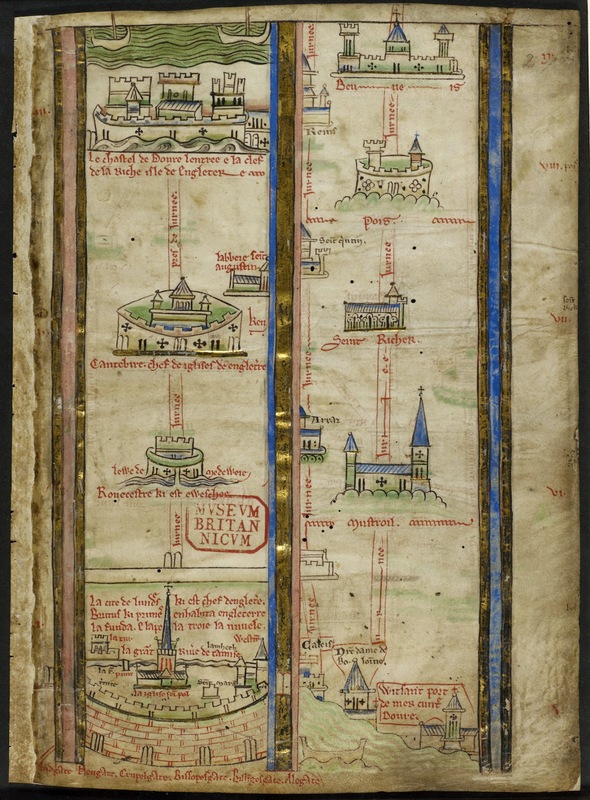 It’s hard to describe the appearance of a portolan chart – the medieval answer to the modern Admiralty chart – if you haven’t already been able to see one. Very few early examples are freely available online but you can find a chart of 1403 here: http://brbl-dl.library.yale.edu/vufind/Record/3521236. Probably originating in the 13th century, though not everybody agrees about that, the portolan charts present the Old World with immediate recognisability. Covering the coastlines of the Mediterranean and Black Seas, along with the Atlantic shoreline up to Denmark (and the British Isles), they contradict every normal preconception about medieval cartography. You don’t need to have Italy, the Nile delta, Crimea and so on pointed out. They are where you would expect and pretty much how they ought to be. Why Pelagios 3 devotes an entire segment to the ‘portolan’ world though is because of their dense toponymy. Taking into account all the islands, an average chart lists perhaps 2000 ports and harbours, as well as natural features, especially the headlands which served as reference points for sailors. Besides the portolan charts we also have access to portolan texts or, to help distinguish the two formats, the Italian term, portolano / portolani. Two of those survive from the 13th century, also the likely date (at its very end) of the Carte Pisane that is generally considered the oldest extant chart. Whereas the delineation of the coastlines had, by about 1340, broadly reached the form that would be repeated for several centuries, the place-names were being steadily updated. Given the Pelagios terminal date of 1492, that gives us a changing toponymy from three centuries of written navigational guides and two in the case of the charts. The portolan component will both enrich Pelagios and, we hope, benefit from it. Less than half the coastal toponyms on the oldest portolani, the ‘Liber de existencia riveriarum’ (early 13th century) and ‘Lo compasso de navegare’ (dated 1296), are found on the other, and a sizeable number do not appear on the charts at all. Likewise the toponymy of the Carte Pisane, and two other anonymous charts associated with it (now preserved in Cortona and Lucca) partly overlap with one another but also have hundreds of names not seen elsewhere. Considered together, these are rich sources for historians of medieval navigation and trade, since their inclusion in these works must point to them having a perceived significance at the time – even more so for the roughly one in five names that were picked out in red on the charts. Overall, and leaving aside the islands, there are about 2000 mainland names that can be tied to a dated chart or atlas before 1492 and something like a further 600 noted only in one or other of the portolani texts or undated charts. Conveniently, both the portolani narratives and the nautical charts provide a geographically linear toponymic catalogue for the Mediterraneanand Black Sea. When the current name can be recognised in its medieval equivalent, or where the successive re-naming has been documented, those fixed points can then be used to locate the approximate present-day position of unidentified names. The most helpful source for this matching exercise will be 19th and 20th-century maps and Admiralty charts produced before expanding ports, or the general touristification of the sandy bits in between, gobbled up the old names, and often what they represented as well. Early gazetteers can help to corroborate the guesswork. That describes the potential contribution that the rich maritime data can make to Pelagios. In exchange, portolan historians anticipate the help that other medieval maps and texts can give with the modern identification of some of the more elusive toponyms they have been wrestling with. Regional historians and archaeologists may also appreciate being introduced to what will be a new source to many of them. The toponymy for some of the portolan regions have already been documented in detail (N.E. Spain, the Adriatic and the Black Sea). Besides what is being extracted from the original documents by the Pelagios team, the remainder will be sourced from a comprehensive listing that was compiled originally in preparation for a chapter in Volume 1 of The History of Cartography(University of Chicago Press, 1987) and then fleshed out and expanded over recent years. The resulting Excel spreadsheet is publicly accessible at http://www.maphistory.info/PortolanChartToponymyFullTableREVISED.xls, where it forms part of a detailed ongoing investigation into the portolan charts (http://www.maphistory.info/portolan.html). **Former map librarian of the British Library (1987-2001), since 1993 Tony Campbell has been chairman of Imago Mundi Ltd, in which capacity he acts as co-ordinator for the biennial International Conference on the History of Cartography. He is working on Pelagios 4 as the expert adviser on portolan charts. The Pelagios team had a paper entitled ‘What Do You Do with a Million Links?’ accepted at the Digital Classics Association organised session at the Society of Classical Studies in New Orleans this month. Sadly, none of us were able to attend in person so to make our contribution we recorded an audio ppt which you can download from the link above (it’s 212MB so you’ll want a reasonable internet connection). Let us know what you would do with a million links! A huge thanks to Neil Coffee and all involved for bringing the session together. About two weeks ago, on Friday October 31, we held the first of two annotation workshops funded through the Open Humanities Awards, designed to gather data through our Recogito “crowdsourcing” interface. The Heidelberg University Institute of Geography kindly agreed to be our host for this inaugural event. A big thank you goes to Lukas Loos for setting up our visit and taking care of local organization, and to Armin Volkmann for his spontaneous decision to merge his geo-archaeology seminar with our workshop on that day. And with what an effect. We were blown away by the results! In just two hours, our 27 participants made 6.620 contributions to 51 different documents (19 text and 32 maps). We’ve written a comprehensive report over at the DM2E blog. Be sure not to miss it! It turns out The Bee Gees were right. 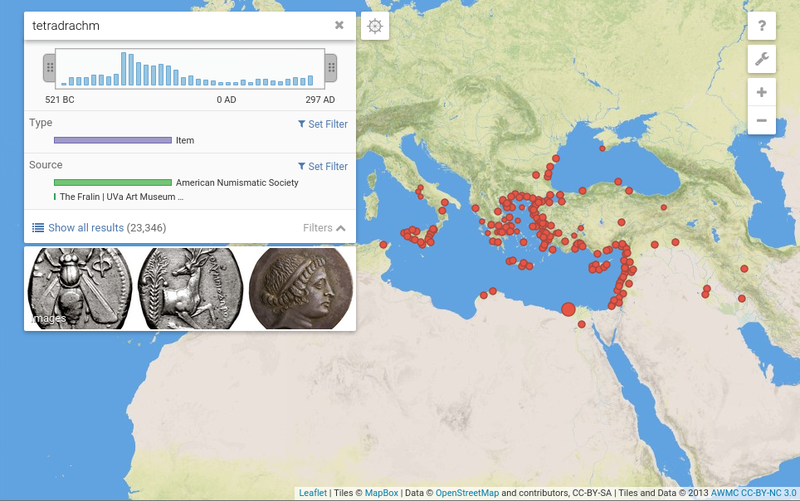 We’ve wrapped up work (for now) on Greek early geographic documents and the experience has made it clear that time, place and motion do indeed feature heavily. First a few statistics. Our objective – as always – has been to identify sources for as many documents as we could, both in the original Greek and in modern translation. Wherever possible we have used open access, online materials so that people can access the texts and read them for themselves. This time we have identified some 66 works, of which we were able to obtain digital texts for 42 of them (and 8 in both languages). You can see our list of available texts on the Recogito public site and we’d be very happy to hear any suggestions for working with those texts which are still missing. Pau has been working like Greased Lightning over these long Summer Nights to produce a remarkable 48,000 edits (and counting)! Pau has not been alone in this work either. We’ll talk more about the new Recogito Editors group in a future blog post, but for now we’d like to say an especially big thank you to Brady Kiesling who donated a large number of pre-annotated texts from his wonderful ToposText project, and even did some translation to boot. Shout-outs also go to Bruce Robertson, Greta Franzini and Monica Berti for their help in OCR’ing Greek geographic texts. Thanks to Rainer’s hard work, the Recogito interface is really starting to shape up. Not only are new features such as detailed user- and document-stats being added regularly, but there’s now a tutorial for users, and various small enhancements were made to the front page (e.g. temporal ordering of documents, so that you can start to see the development of ancient geography at a glance). There are other major changes afoot for our third Content Workpackage on the early Christian tradition… but you’ll have to wait for another blog post to hear more about that. 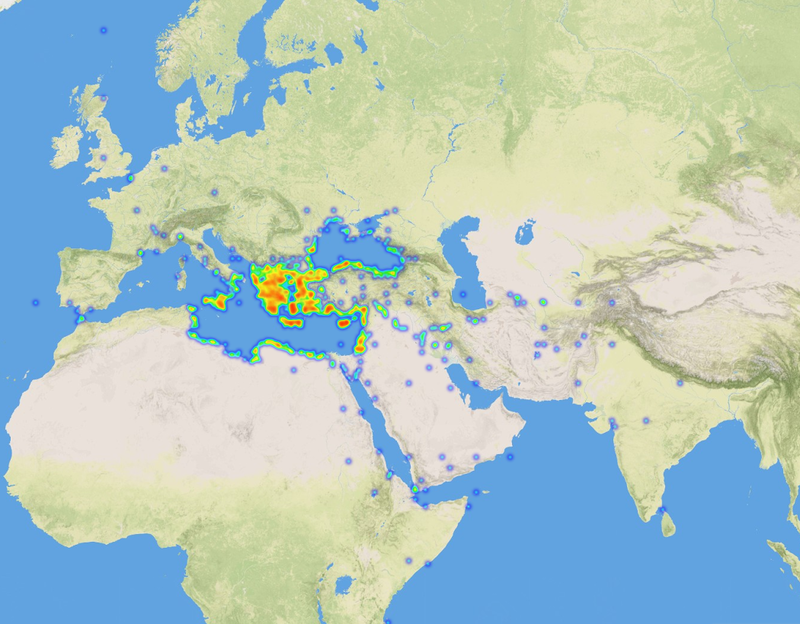 Just like last time, we’ve generated a preliminary heatmap of our work on the Greek sources so far. Even incomplete as it is, it’s fascinating to see our authors focus not only on the Aegean Sea, Magna Graecia and the Black Sea, but also their explorations along the Red Sea, the Atlantic and even the Silk Road. So what about those sources? The list of documents we’ve been working with includes some of the biggest and most important in the history of geography, including Strabo, Herodotus and the immense Suda. We said that Greece was the place, but in fact what we are really talking about, and what emerges from these early investigations, is just how many places the “Greek world” comprises of and how many places “Greek knowledge” extends to. Time also plays an essential role. From Ptolemy’s “Hour Intervals”, which divide up the world like the face of a huge celestial clock, to the Spartan Cleomenes’s alarming realisation that it was not a matter of days to travel to the Persian capital but months, time is used to try to make sense of, or express bewilderment at, the vast distances being talked about. And Greek geography is not just static, but frequently in motion, with stadiasmoi, periploi, itineraries and even the occasional International Business Traveller. We hope you enjoy exploring these documents as much as we do. If you’d like to get involved and help us annotate the rest, please do get in touch. We’ll go together like….